It’s been a great year for KDE in Brasil, This post will just summarize a few things that happened here. Akademy – BR put this colossal country together to strength the links in the community, and created friendships. KDEEduca being reborned by the syst – team, a company that uses a kde – based distro. Bigger KDE – Release Partie Event, more than 6 states participating. And probably a lot of other things that I forgot. but it’s still impressive for a country that had an almost 4 persons KDE team in 2 years ago. with a bof on gathering universities students as interns for KDE. my newest tryout. let’s see how’s that going to work. Na conferência o destaque vai para as keynotes “MeeGo redefining the Linux desktop landscape” por Valtteri Halla (Nokia) e “Reaching For Greatness” por Aaron Seigo (KDE), e as palestras “The 7 principles of successful open source communities” por Thomas Thym, “Plasma sneaks in your pocket” por Artur Duque de Souza e Alexis Menard e “Social Games” por Dan Leinir Turthra Jensen. Além da conferência serão realizados encontros (sprints) focados em sub-projetos tais como animações do Plasma, QML, Nepomuk, Telepathy, KDevelop e Gluon. So, I’m putting a draft of what I have till the moment, and I hope you help me designing a proper API, by commenting on it about features you wish, class/methods naming and so on, in order to make it as KDEish as possible. Also, is there a better place for this discussion/brainstorm? I think a wiki would be better suited for people to contribute, but I’m not sure the TechBase is the right place for this. There are a lot of code to write yet, but I’d like to get some advices about it. Thanks in advance. Posted by Aracele Torres in planetkde-araceletorres. We’re very pleased to properly formalize through this blog the creation of thegroup of KDE users and contributors from Piauí. 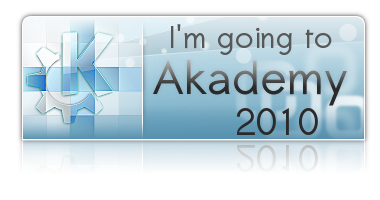 It was officialy formed during Akademy-Br 2010, held in April in the State of Bahia, and got stronger after the activities about KDE that took place on FLISOL 2010 Teresina. By creating this group we intend to help, in all possible aspects, the development, improvement and promotion of KDE SC and free software in general. In order to achieve that goal, we’re assisted by many supporters from many areas of study: Leonardo and Angela (Art students); André (Pharmacy student); Bianca (Chemistry student); Filipe, Gustavo e Francisco (Computer Sciences students); Aracele (History student); Sérgio (Philosophy student) and Antão (Jurist). To begin with it we’re going to study coding, because everyone shows interest in contributing to KDE with good codes. But we’re also dedicated to provide the community with translations, promotions, artworks and bug reportings. We look forward to properly representing KDE in Piauí so we can show people what it has got, and why we should use it and help it. Our logo mixes the cog, the official KDE symbol, with the carnaúba tree – one of the plants which represent our brazilian State. It’s been created by our art designer and supporter Pedro Leonardo, and from now on will be used as the official symbol of KDE-PI. Importantes passos tais como o modelo de contribuição que nós apresentamos no ano passado têm levado isso cada vez mais adiante – nós recebemos e integramos centenas de contribuições desde a disponibilização deste canal. Nós acreditamos que chegou a hora de levar esse modelo uma vez mais pra frente e tornar a nossa comunidade ainda mais influente através de uma mudança na forma com a qual o Qt é gerido – caminhando para um modelo de governança ainda mais aberto. The vacation period for brazilian universities is approaching, and as usual since last year the KDE – Brasil team is proud to invade all nearby universities for a quick chat with students. But not a father-to-son talk, we are invocking them to our army, and how? We have a bunch of presentations in our resource page that anybody can use to help ( however, all of them are in portuguese ). But What’s the plan of KCall To Arms? Gather Students to hack on KDE? Hell no, too fast for that, KDE is not widely used in Brasil, because *nix is not widely used in brasil, so the first thing is to show the students and professors that they can have better working tools by using it. Centro Universitário Salesiano, invaded by Cochise.